Automatic hammers transfer more energy — and more consistent energy — to the drill rod compared to manual hammers. Since the first customer approached us a decade ago seeking an automatic drop hammer, we’ve seen demand grow due to new laws and regulations overseeing equipment used for standard penetration tests. As you know, SPT measures the relative density of soil by tracking the number of hammer drops it takes to drive a split spoon sampler into the soil. 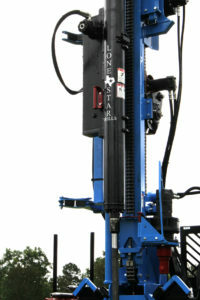 The results, however, can vary from one operator or drill rig to the next when using manual drop hammers. While experienced operators can take accurate samples using a cathead kit, automatic hammers transfer more energy — and more consistent energy — to the drill rod as the hammer’s momentum and drop is uninfluenced by the operator. This results in less of the hammer’s energy being lost due to friction or lateral movement. Sample consistency improves due to the decreased variance in the hammer’s drop height. An emphasis on improved consistency has resulted in more states and cities requiring automatic hammers. The trend started in areas such as New York City — where that initial contractor was forced to ditch his manual drop hammer — and has spread to an ever-growing number of states and municipalities, leaving many geotechnical engineers scrambling for economical solutions. To address the growing demand, we modified our LST1G+HD geotechnical rig by incorporating a 140-pound automatic hammer, resulting in the LST1G+HDA. 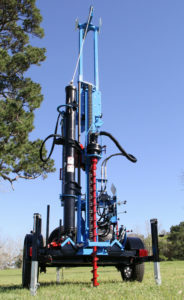 The drill is compatible with our split spoon samplers and AWJ drilling rod for obtaining core samples as well as conducting geotechnical testing and environmental soil sampling. With the number of jobs requiring automatic hammers continuing to trend upward, the best way to avoid losing a bid or being left scrambling for a solution is to stay on top of the laws and regulations in the cities and states where you work. And if you find yourself looking for an economical and highly portable solution for accurate SPT tests and soil sampling, the LST1G+HDA will give you a competitive edge.